How to become a travel writer? Here are some tips from a workshop with Don George in Ubud. I hope it will helps you, as it helps me. This article has been published in Venture Magazine April – May 2013. “A sign of less sophisticated writer is using too much adjectives,” says travel writing teacher Don George. Don’t we throw knowing looks at each other and giggle, scratching out words from our notebooks. I’m one of 20 participants in a one travel writing class in the Ubud Writers and Readers Festival, an annual literary festival held in October, in Ubud, Bali. Our teacher is Don George, the Global Travel Editor for Lonely Planet Publications. “Travel writing won’t make anyone rich, but you get rich in the account of experience,” Don tells us, mopping his bald head with a towel and apologizing for sweating in the tropics. We have met in the Swasti Eco Cottages in Nyuh Kuning, a quiet, green hamlet near the Ubud monkey sanctuary. The wind dances through the bamboo gazebo, our open-air classroom, and we can hear goats bleating, crickets screeching, and the kukuruyuk from the cockerels. Sitting on bamboo chairs, with notepads and Balinese coffee in hand, we hope to learn the magic of travel writing. Don starts by defining that travel writing seeks to illuminate a place, to educate and inspire people about the world, and to share the learning from travel experiences. He leads us in a walk around the cottages, like a ringmamster, transforming us into a traveling class. We pass a garden with rows of neatly labeled organic fruits and vegetables, bursting in degrees of orange, red, yellow, and green. A gardener picks ripe tomatoes, telling us we’ll eat them later for lunch. We re-meet the tomatoes at lunch, served with fried brown rice, chicken, vegetable, and chilies. Then we are given an exercise: to write a paragraph about our experience in Swasti Eco Cottages and read it aloud to the group. For 20 minutes the only sounds are the scratching of pens on paper and the creaking of rickety bamboo chairs as twenty brains excavate sophisticated adjectives from the dusty drawers of memory. “Traveling with a travel writer’s mindset allows you to become a better traveler,” says Don, before closing his lecture for the day. When the class ends I’m suddenly the only one left standing on the quiet road through Nyuh Kuning. The scorching sun splatters red havoc across the sky, but I’m not ready to go home yet. I find a tiny warung in front of a house and can smell coffee and banana being fried. Tourists wearing Balinese sarongs and spiritual rudraksha beads around their necks cycle past, perhaps to a yoga class or to dinner down the hill. Sitting down on the wooden bench with my sweet, dark coffee, I think think about today. 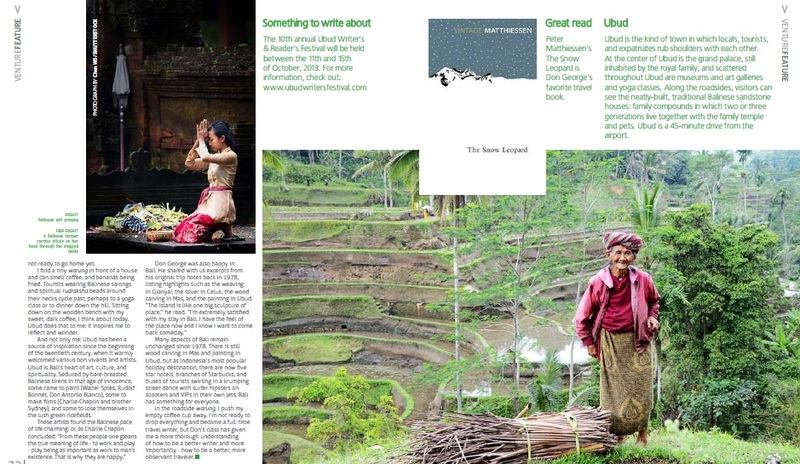 Ubud does that to me: it inspires me to reflect and wonder. And not only me: Ubud has been a source of inspiration since the beginning of the twentieth century, when it warmly welcomed various bon vivant and artists. Ubud is Bali’s heart of art, culture, and spirituality. Seduced by the bare chested Balinese sirens in that age of innocence, some came to paint (Walter Spies, Rudolf Bonnet, Don Antonio Blanco), some to make films ( Charlie Chaplin and brother Sydney), and some to lose themselves in the lush green ricefields. Don George was also happy in Bali. He shared with us excerpts from his original trip notes back in 1978, listing highlights such as the weaving in Gianyar, the silver in Celuk, the wood carving in Mas, and the painting in Ubud. “A very special visit to the house of the old artist, Kobot... the island is like one big sculpture of place and people who call you back and back again. I did not get to see the dance I wish to see but otherwise I’m extremely satisfied with my stay in Bali. I have the feel of the place now and I know that I want to comeback someday”. Many aspects of Bali remain unchanged since 1978. There is still wood carving in Mas and painting in Ubud, but there are also more five stars hotels and Starbucks, and buses of tourists swirling in a krumping street dance with surfer hipsters on scooters and VIPs in their own jets. Bali has something for everyone. In the roadside warung, I push my coffee cup away. I’m not ready to drop everything and become full-time travel writer, but Don’s class has given me a more thorough understanding of how to be a better writer and more importantly – how to be a better, more observant traveler. Thanks for sharing this with us and also thank you for telling how to be a really good observant. I read your whole post and I really liked your post. Thank you for your kind comment. It was a fantastic workshop.